Fox News' "Illegal Immigrants" Vs. Fox News Latino's "Undocumented Immigrants"
The news that the AP has dropped the term "illegal immigrant" from its lexicon was met with scorn and derision on the "fair & balanced" Fox News network. Steve Doocy suggested a conspiracy; i.e. that the AP was "cheerleading for immigration reform." Brian Kilmeade asked why anybody should care about the bias of the rejected term when these folks are "here illegally." On Neil Cavuto's show, Michelle Malkin did her patented snarling snark about how the AP is trying "to radically redefine the definition of citizenship." But the Fox News website is sticking with the patriotic American "illegal immigrant." Meanwhile, Fox News Latino is using the scorned and derided term. Paging Dr. Ablow, Fox media has a serious split personality. 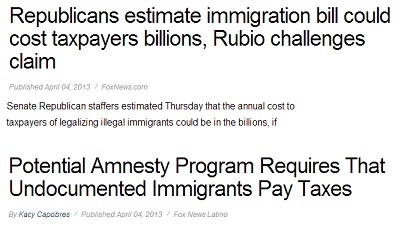 Is Fox News Latino "cheerleading" for immigration reform? Latino viewers are very well informed about this fraudulent “new” network. They were informed by the masses that Ruthless Rupert is more concerned about their money, than their interests. We will continue to inform the Latino community about these frauds. If you want my theory, I think Fox News is just dumb (and racist) enough to think that people who aren’t white only read outlets that cater to them. Any Latino with 5 minutes to read the comments on a Fox News or Fox Nation article about the immigration debate knows exactly which side of the coin Fox and it’s viewers are on. They also know that Fox would hand out the guns if they could do it legally.